I apologize I haven't posted in some time....the second half of 2012 was pretty bad. I will post on that at some point. Anyway, 2013 is a new year...with new toys! I had been using a 2008 15" Macbook Pro for all of my photo work. Unfortunately, the apt I was living in caught on fire and that computer got soaked from firefighter water. I will post more on that later but I have to say that firefighters are prob my fav people in the world now. Anyway, thankfully I had good insurance and got to get new laptop. For a replacement, I picked up a 15" Macbook Pro Retina (2.7/16gb/7XX GB SSD). I was going to get the 2.6 because I read that the performance improvement wasn't that great, but I needed a computer one weekend to finish two photo jobs I was working on. Apple had the config I ended up purchasing in stock but not the 2.6. So this one won out. Initial impressions: this think rocks. Screen is crisp like nothing you've ever seen. Needless to say, my photo collection looks awesome, but even little things like the text on gmail you notice. It's very thin, a little heavier than you'd expect, and fast as hell. I picked up Lightroom 4 for a song during Amazon's black friday sale and it loads really quickly. Scrolling is a breeze. External editing with Photoshop and Nik plugin's is SO much faster than my old setup it's not funny. I've had too much school work to do lately to use this laptop that much (I've got a 2009 13" MBP I use for that), but I'm looking forward to this guy becoming my daily driver. Above you can see the Blackmagic test on the internal SSD. Purty speedy. It's not a scientific test but just gives you an idea re: read/write speed. I do science for a living so no scientific tests here. After the fire I also thought it was a good idea to revamp my backup situation. I have a valuable (to me) photo catalog that also has client photos in there, countless hours of PhD thesis work, and all sorts of other stuff I'd rather not lose. I originally thought about Drobo but have read some bad things (not about the company, but rather their products). I decided to go with RAID arrays over piles of other hard drives. After some research, I went with a Promise Pegasus R4 Thunderbolt array and a Sans Digital eSATA/USB3.0 box with WD Red Drives. I've got everything plugged into an APC BR1500G UPS for power management. I was a little hesitant about the Promise because of the negative reviews on the Apple store website but went for it anyway. 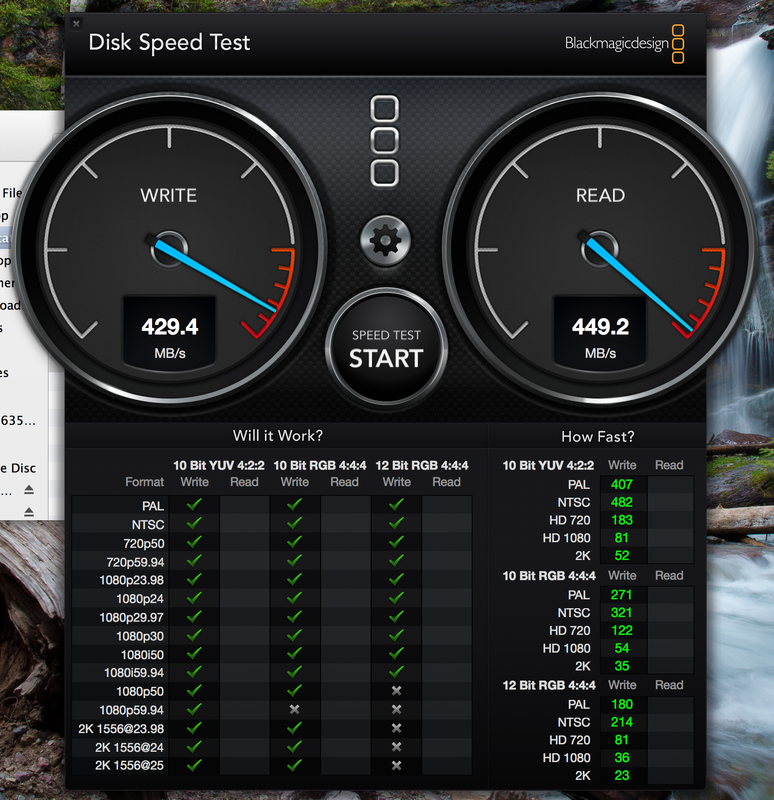 I just went with the 4TB R4 (4-bay) unit that comes with 4-1TB drives preconfigured in a RAID 5 configuration. First thing I noticed...instructions say it takes 8-10 hours to synchronize when you first plug it in. After I disabled all the energy saver settings and told the computer not to turn the hard drives to sleep, I estimated it took ~36 hours for it to synchronize. A little longer than they said but hey it finished. 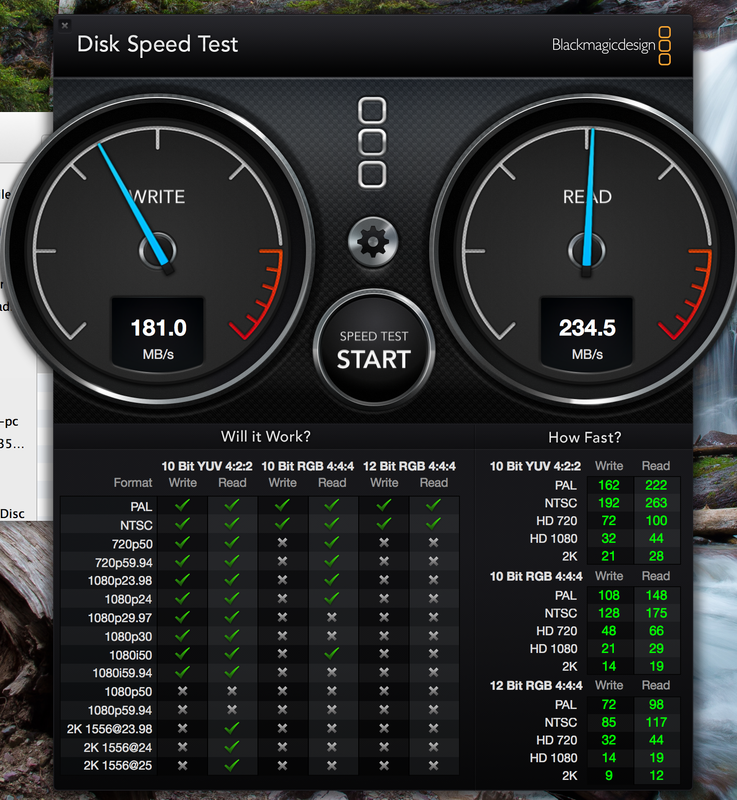 First file I transferred was a 33 GB movie file...took about 1 minute to go from internal SSD to Pegasus!!! Performance tends to fluctuate a little but I see speeds as advertised (below). More long term testing to come. I'm planning to no longer store my photo library/catalog locally and run it from this puppy. Should make edits a breeze. Also, if you purchase this through the Apple Education store it's cheaper (~$100 off).